The recent attack on a well-known NGO functioning within Ahmedabad's St Xavier's College campus, Human Development Research Centre (HDRC), allegedly by saffron youths in “protest” against the advertisement for a sweeper's post to be chosen preferably from among among dominant castes, is all set to acquire a fresh spin. 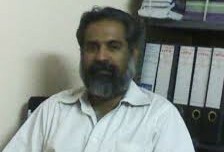 A daft "solidarity" note circulated for endorsement among fellow travelers by several senior Gujarat-based activists in favour of the HDRC and its director Prasad Chacko, who was the main target of attack by saffron supporters, has declared that the controversial advertisement “does not violate any law of the land”. Those who have sought endorsement are senior of activists of well-known NGOs -- Jitendra Rathod, Nayan Patel, Geeta Oza, Hozefa Ujjaini, Brinda Pancholi, and Vijay Parmar. The signatories have not said whether they have sought support in individual capacity or as office bearers of their respective NGOs. The draft note, which is likely to be made public on July 11 after a wider endoresement, has sought support amidst continued threats by “many individuals and groups” to file complaint under section 153A of IPC against the HDRC and Chacko, with an application having already been submitted to the Gujarat University Police Station in this regards. “In addition to that many have given notice for clarification and public apology to be given by the HDRC”, the draft note says. Referring to the contents of the advertisement – which was put up on the notice board of the HDRC on April 6, nearly one-and-a-half months before the saffron attack actually took place – the note finds nothing wrong with the identification of castes for the selection of a sweeper, Brahmins, Rajputs, Patels, Banias, Jains, Pathan, Syed, Syrian Christian, etc. The draft note stands in sharp contrast to the view expressed India's well-known Dalit rights activist Martin Macwan, who said in a recent blog that one cannot hope to talk of “annihilation of caste” (a phrase used by Dr DR Ambedkar) by naming castes the way the HDRC did. Macwan has been a key architect in India in the fight against manual scavenging and caste-based occupation. The draft note also regrets that even “secular individuals and organizations” failed to appreciate the actual framework of the advertisement. While they seemed to join hands to support the HDRC, largely “Dalit rights activists and organizations conglomerate came together”, it adds. This, the draft note says, “is evident from the fact that community leaders/ organizations from these communities have joined the protest and sent memorandum/ complaints to the HDRC directly or via different mediums”.